The ASUS RX460 STRIX brings entry-level gaming to a new level – it’s compact, cool, quiet and packs a bigger punch than we were expecting. 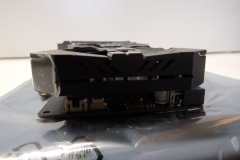 Sporting the 14nm FinFET Polaris 11 architecture, the RX460 GPU from AMD was intended to make a splash – ASUS gave it the STRIX treatment to make sure that splash was even bigger. 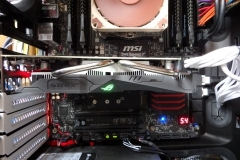 I’ll declare it up front – we really liked this graphics card. 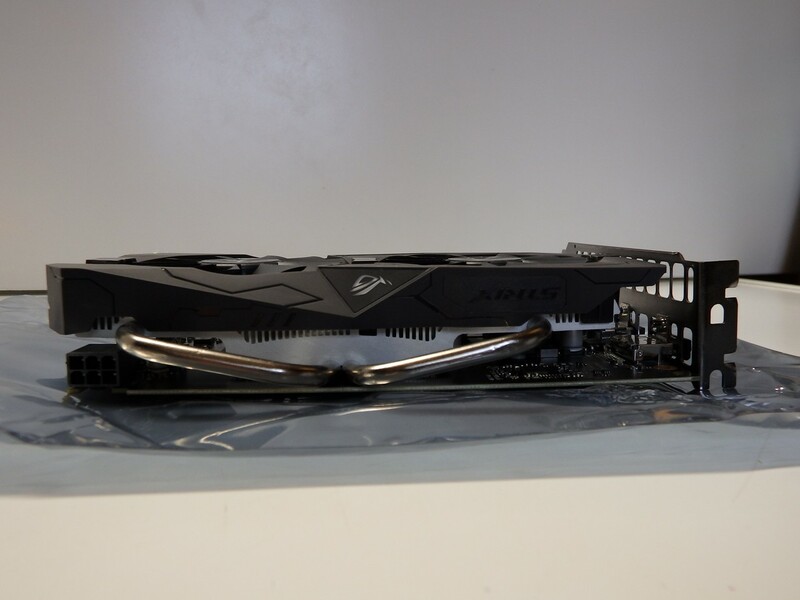 The ASUS ROG STRIX RX460 impressed us throughout the testing on many levels. The GPU is the only entry-level thing about this card, the cooler is as high quality as it gets. Whilst NVIDIA released their new GPU line up in top-down order, starting with the beastly GTX 1080 at over $1,000 – AMD took a different approach with the release of the mid-range RX480 and then the lower spec’d RX460 and RX470 GPUs. This move was great news for budget conscious gamers looking for something new. The Polaris architecture is the next evolution for AMD and involves a more efficient, cooler result with a graphics core optimised for DX12. The ‘here and now’ RX460, RX470 and RX480 are an encouraging sign of the new architecture. 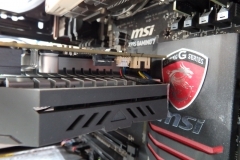 I wouldn’t normally look at an entry-level card twice but this one is different – for a start it’s packing 4GB of GGR5, has a virtually silent cooling solution, RGB LEDs, flawless build quality, relatively small footprint for a non-ITX card and the performance has reset our expectations of entry-level. 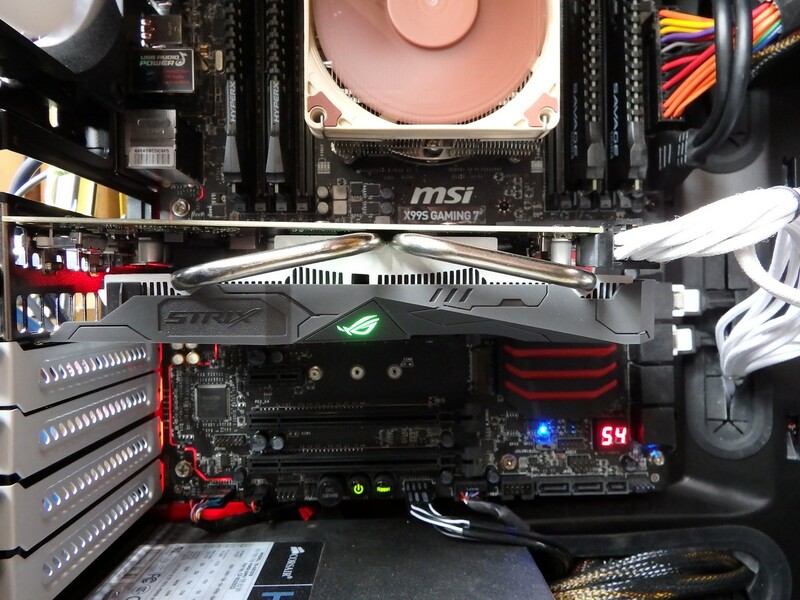 When we usually discuss entry level cards amongst ourselves or with gamers at LANs, the first thing most people say is “Yeah but…” and then a list of things an entry level card can’t do start to flow – things like VR, playing games at Ultra settings etc. This is all true but the price in this case is about half of a decent mid-range card so how about we spend a bit of time in this review looking at what it can do? We put the ASUS STRIX RX460 through the standard benchmarks, the in-game benchmark utilities and then went to town with some general gameplay testing which is where we really appreciated the value this brings to the lower end of the market. Let’s spend a moment to look at the so-called lower end. This is an area that has either a restriction on price or where a gamer only needs more than integrated but not as much grunt as the mid-range cards. We don’t all need massive horse power pushing our pixels and the typical eSports titles aren’t as demanding as the latest release AAA titles. The STRIX RX460 comes with an OC mode hitting 1256MHz and a Gaming mode (default) running at 1236MHz. It should be noted though that there are no true ‘reference’ cards available with the stock boost clocks of 1200MHz. 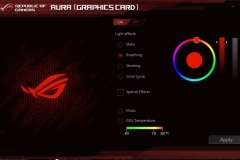 For this reason, we left the card in Gaming mode as the ASUS design team intended it to be used. 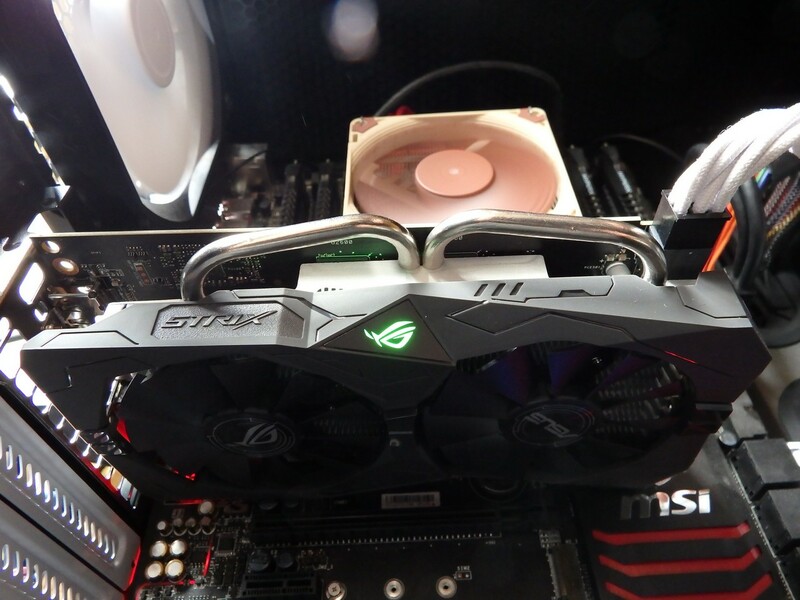 ASUS strapped on the dual fan STRIX cooler to keep things cool and quiet despite giving the GPU a 36-56MHz nudge for a better result when gaming. 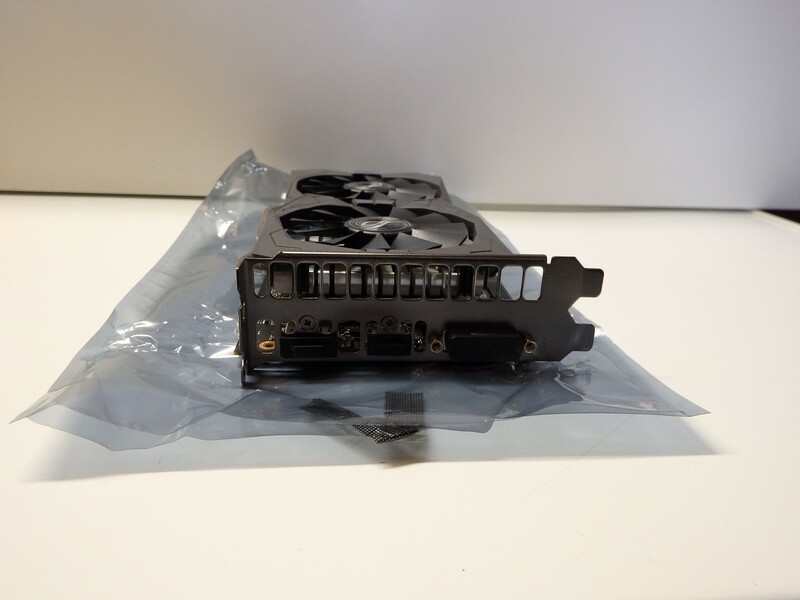 The card is compact and looked small in our Define R5 case. There is a single 6-pin power connector and is easy to access. 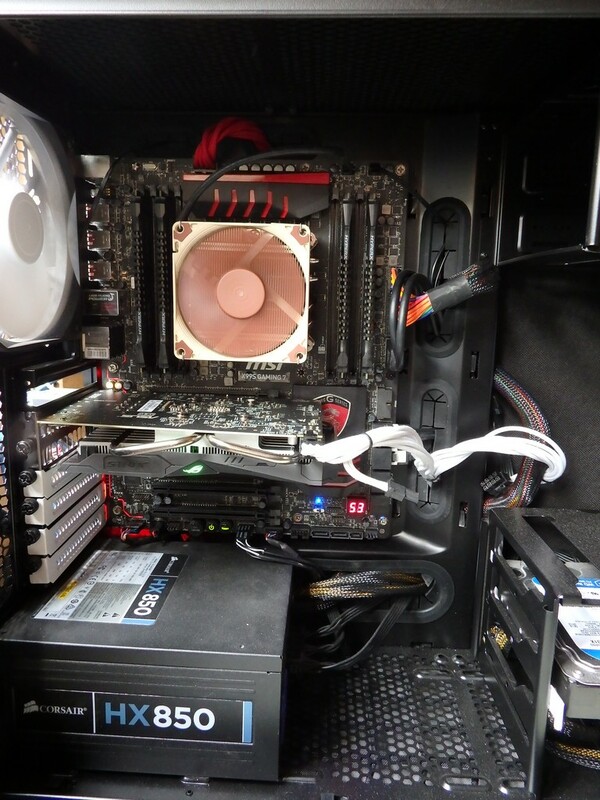 There is a neatly-concealed but still very accessible 4-pin fan header – Yes, a case fan header! 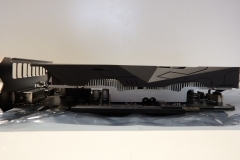 The STRIX cooler will go passive at low temperatures so if the case airflow and ambient temperatures are managed, the twin fans on the graphics card cooler don’t have to work as hard. 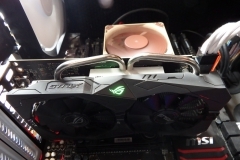 By linking a case fan to the cooler with the ASUS software, you can control the airflow over the card or through the case to help manage the noise and thermal profile. This is a brilliant design feature and ASUS really kicked a goal by including it. The price to performance ratio of the RX460 STRIX is set to the entry level. 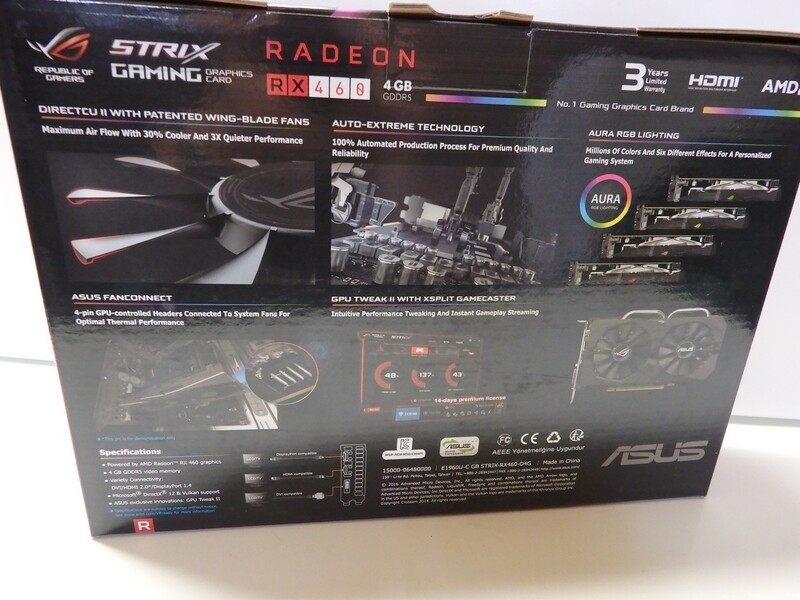 The ASUS Strix Edition costs more than some of the other versions of the RX460 that come in closer to or even below the $200 mark. This seems fair enough when the build quality, Aura lighting, virtually silent cooler and generous overclock are all put into perspective. As with other current AMD GPUs, FreeSync is supported to smooth out the experience if you have one of the quickly growing list of monitors that support FreeSync. The card comes with DVI, HDMI and DisplayPort connections – so for those still using an older monitor with DVI, no extra dongles or uprades are required. 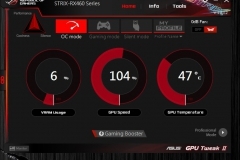 The ASUS STRIX cooler is a legitimate ‘Premium’ cooler. It is extremely effective, makes very little noise and looks completely badass. 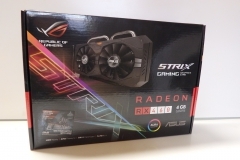 The STRIX version of the RX460 takes an entry level GPU and makes it ‘fancy’ with higher clock speeds, customisable AURA RGB lighting, almost silent operation and a build quality that seems out of place at this end of the market. 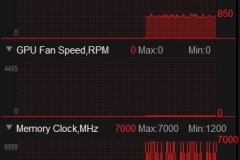 The STRIX cooler on this card really is that good. The Crimson software from AMD, the ASUS Aura and the ASUS GPU Tweak II utilities were all 100% stable throughout all of our testing. We didn’t see any memory leaks, lockups or other issues at a system level, nor did we experience any in-game issues or driver crashes. 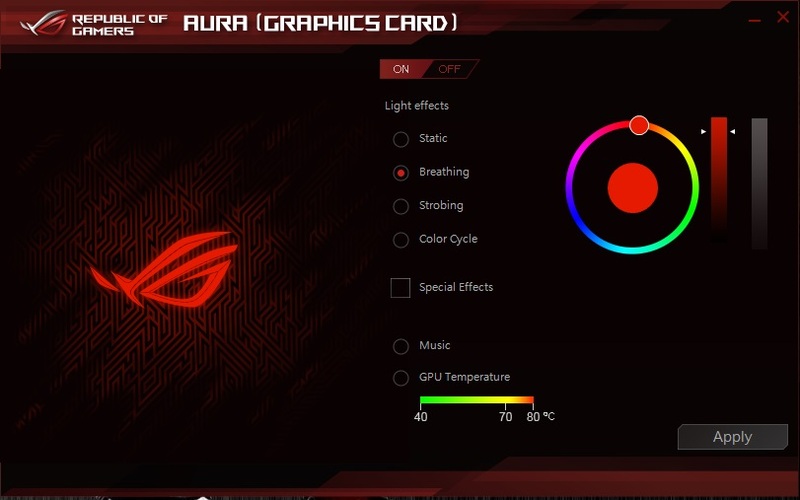 The ASUS software was intuitive and allows gamers to create a custom effect on an entry level GPU – nice! The full specifications of the ASUS ROG STRIX RX460 are listed below. 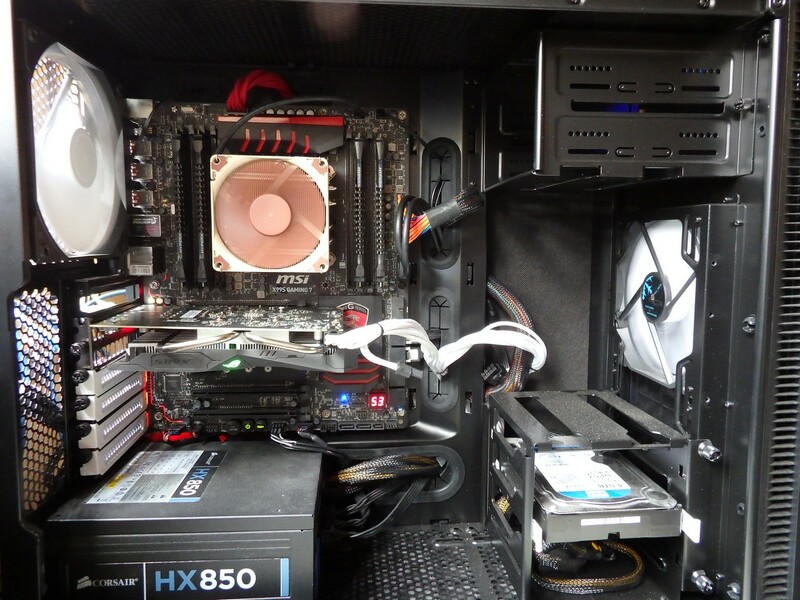 For comparison, the RX480 36 Compute Units and 2304 Stream Processors and a 256bit Memory interface but it draws 150W. This comparison is important when forming realistic performance expectations of the RX460. This is a beautiful enough card when it’s unlit but it really comes to life when the Aura RGB lighting is doing its thing. It feels solid and looks expensive, our review sample was absolutely flawless. Despite being bigger than a true ITX-sized card, it still seems compact. In operation, the card remains cool and so quiet that I’d consider it silent. 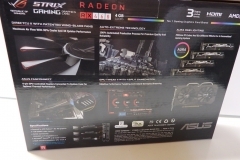 As a package, the execution of the RX460 STRIX seems over the top for an entry-level GPU – on the other hand though, ASUS have really done this ‘little’ GPU justice. We tested the AMD RX460 on our MSI X99S Gaming 7 test rig as listed below for all of the benchmarking and general game-play. We also used the BenQ XL2730Z 144Hz 2560×1440 27″ display via DisplayPort using the cable that came with the monitor in the retail box. We also still had the Noctua NH-L9x65 fitted from a previous review but left it there due to the ease of access that it provided for the PCIE release lever and access around the board. Benchmark testing where we use a scripted or specific benchmark utility that has no user interaction other than setting the graphics properties and hitting ‘start’. The utility then gives us a report of the relevant statistics. We also only graph the average frame rates as minimum and maximum frame rates can be misleading. The following tests were all reproducible or scripted or in-game benchmarks that are consistently executed without human intervention. We’ve moved on from the older 3DMark11 benchmarks that still hold relevance for some but the latest benchmarking tests from Futuremark give modern day GPUs a serious belting at the extreme, high end and mid-low end levels. 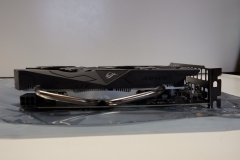 In these synthetic benchmarks, we see the RX460 STRIX come in dead last but this is an entry level card competing with the upper to mid-range of today and the previous generation. Firestrike Ultra is first up and gives a good indication of how ‘4K-ready’ a GPU is. We tested SkyDiver in the interests of completeness but the result is aimed at low end graphics platforms. Unigine Heaven Benchmark 4.0 Basic is one of the programs that we run to temperature test the cards and we also do a benchmark run during the process. 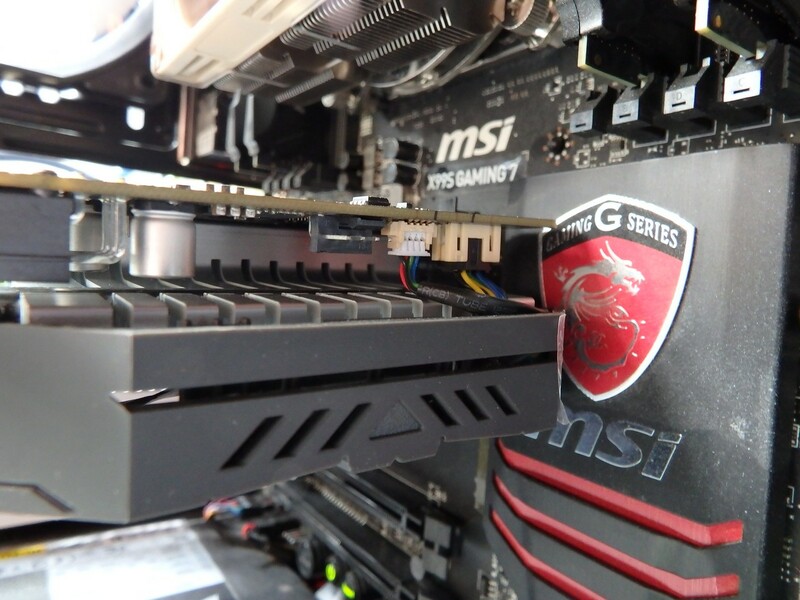 This benchmark taxes graphics cards to see how well they handle the load of DX12. 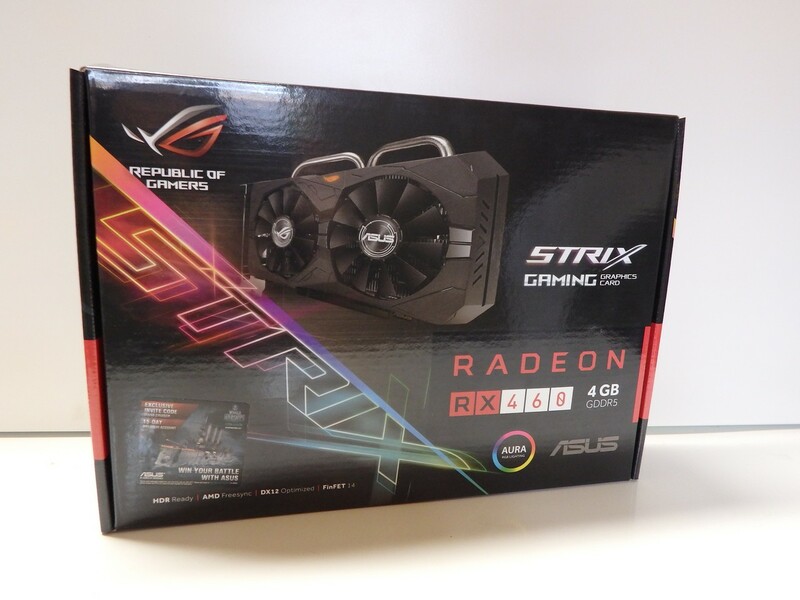 Despite the low score compared to the other cards in the line-up, the RX460 is an entry level GPU, it doesn’t use much power, generate much heat and in the case of the ASUS STRIX edition, it’s basically silent. In some of the synthetic benchmarks, the RX460 is much closer to the GTX 960 of the previous generation than we were expecting. Although TRESSFX is an AMD feature we had it enabled because gamers will want to enjoy it in this title and we have other benchmarks so it all evens out in the end. At 1080p, the RX460 only averages 44FPS so compromises would be needed to maintain 60FPS for a smooth experience. Despite being only 7FPS behind the GTX 960, 21.7FPS is still not going to cut it at 1080p in Hitman Absolution with everything cranked up. Hitman is a title that still slaps most mid-range cards around. The 1080p result for Bioshock Infinite is absolutely playable and a good example of the value you can get with the RX460. Sniper Elite III is an older title and can be had for a bargain at Steam Sale time and the ASUS RX460 STRIX won’t kill your wallet either – as it happens, they are a good performance match at 1080p as well with an average experience of 71FPS with all settings ramped up to their highest. If GTAV is your thing, we’d recommend saving a little extra and grabbing a card from the next price bracket if you are on a budget – making the RX460 GPU play this game with the eye candy up high is just downright cruel. As a casual player, you might be able to get by but compromises will need to be made. The gap between the GTX 960 and the RX460 was a lot smaller than we expected at around 5FPS – it was still pretty low as to be expected at ultra settings (for the standard benchmark). If we selected the ‘high’ graphics option we saw an average of 37FPS but we got up to 50FPS on the ‘medium’ setting which made for a playable experience. The RX460 wasn’t happy running AOTS above the ‘Low’ setting where we saw an average of 45.4FPS. This was playable at 1080p but really only just. The DX12 performance of the RX460 was basically neck-and-neck with the GTX 960 and despite the 35FPS at 1080p, it was actually more playable than the frame-rate would suggest. 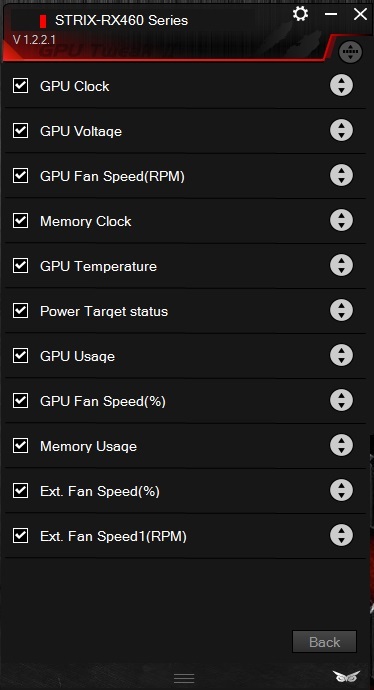 It’s a good indication of how DX12 optimised the new Polaris GPUs are. When testing the AMD RX460 in general gameplay, we had both FRAPS and any in-game frame counters running so we could see the frame rate for reference when needed but also to note any material variations. The methodology is to play the game and note the typical FPS, any rendering issues, look for stutter and also keep an eye out for imperfections around colour or missing textures that impede the immersion. These tests are subjective, less reproducible and much more prone to variation so the results are not compared to other cards. This is a good representation of my experience with the review sample and what you should expect if you went out and bought this card. 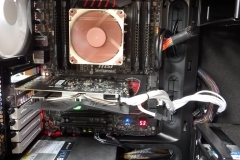 All observations were made on the test system used for benchmarks connected via DisplayPort and running at a resolution of 1920×1080/144Hz unless specifically noted in the comments. We had to settle for ‘Medium’ Settings with V-Sync turned off. The reduction in quality and occasional stutters when things got really busy did impact the ambience a bit but the game was playable and we did manage to complete a few missions without finding the performance of the ASUS RX460 STRIX a constraint. At medium settings, the frame rate was around or just below 50FPS at 1080p which is a great result for an entry level card. Black Ops 2 is a fun but very competitive title that is still quite popular despite its age. We consistently saw 120-125FPS @ 1080p with all settings maxed out. The gameplay felt really smooth and crisp – perfect for competitive play. When we increased the resolution to 1440p, the frame rate dropped to 65-85FPS with higher variation but still in a very playable range. 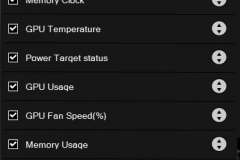 The RX460 Strix was never going to play BF4 set to Ultra. Typical frame rates were between 48-58 FPS on High settings and 65-70FPS on medium. 1080p gameplay at ultra settings was solid at 42-60 FPS in this older but still very enjoyable title. For a gamer on a budget, the RX460 and Skyrim make a good pair. Gameplay was completely addictive and smooth here giving us 70-75FPS at the 1080p resolution. This title is another one that can incur a lot of lost hours once you really get into it. This was a bit of a surprise – in a good way. The experience of playing Fallout 4 at high settings saw a result of 45-60FPS with the rate sitting at a typical 50FPS. Not awesome but still pretty good for entry level. At medium settings, the performance was a solid 60FPS and after getting a little distracted during testing, the reduced quality wasn’t an issue and I could have spent another couple of days wandering the wastelands with the RX460. As a turn based game, FPS is less important and we were pleased with the 45-50FPS at 1440p in that it was playable. Now we’re talking. This is what the RX460 was made to do, deliver eSports gaming without a prohibitive price tag. CS:GO performance at 1080p was typically in the 120-140FPS but it did go up to 177 in our testing. Performance at 1440p was 60-75 with a high point of 90. We can’t complain about a steady 75FPS with maximum settings at 1080p. The only limitation here was how rusty we were with this title. The original shaped many a gamer and is an undisputed classic title. The remake captured the spirit of the balls-to-the-wall shooter genre perfectly and will also be a classic in time. The ASUS RX460 STRIX allowed us to enjoy this without compromise. We experienced a solid 60FPS with the settings at ultra on our 1080p testing using the Vulkan API. Another competitive eSports title that the RX460 caters for at 1080p. The indicative frame rate was 75FPS with settings at their maximum. This dropped to 45FPS with a resolution bump to 1440p. All up, at 1080p the RX460 delivered enough performance for one of us to top score in 3 games so it certainly wasn’t holding us back. This is an interesting one, CRYSIS 3 is regularly on sale or affordable and it is a lot of fun to play so it is likely to be in the library of a casual gamer. The challenge is that the terrain and graphical intensity change throughout the storyline. 1080p with high settings was a typical frame rate of 40FPS but this really improved to around 60 at the medium pre-set. The tricky part is that the 60 did have dips depending on the area we played in. An oldie, but a goodie. 1080p performance was 90-110FPS and 1440p performance was 75-81 as a typical range. For an entry level or casual gamer, this would also be a title we’d expect to encounter and the RX460 handles it well. Whilst we saw performance in the range of 55-85FPS, the typical experience was really 55-60 with high settings which is still pretty good at 1080p. It’s performance like this that shows the value of the RX460. 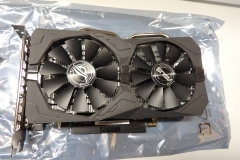 When running the ASUS RX460 STRIX through its paces, I considered the gamer that would buy this and what they would likely want to play on it. 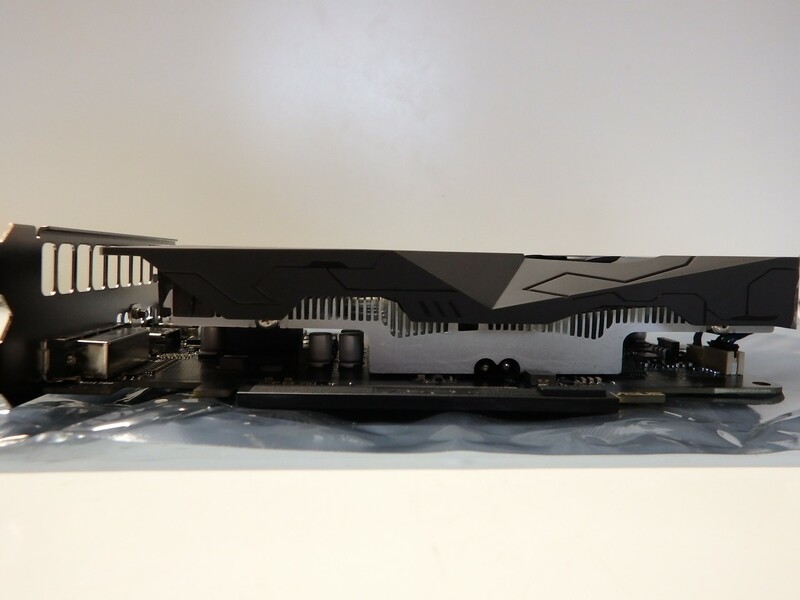 As a budget card, this is impressive and it punches above its weight division – especially in DX12 compared to the previous generation of NVIDIA and AMD Radeon GPUs. The acoustic profile of the STRIX cooler was also very impressive and I had to keep looking at the fans to see if they were spinning. I’d consider this card basically silent inside a case when gaming. 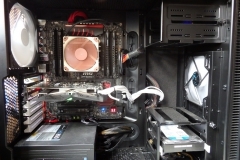 Our test setup was housed in the Fractal Design Define R5 with quiet fans and noise dampening material but even with the side panel removed, the graphics card was inaudible. The STRIX cooler didn’t register on our decibel meter more than 30cm from the open case. Within 30cm, we recorded a reading of about 36dBA under load. The real-world experience was that the card doesn’t make any noise. Thermals were an idle temperature of around 33-34 degrees typically with the maximum temperature we recorded under load reaching 69C with a typical gaming temperature of low 60s. 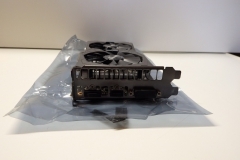 One thing to remember with cards like the STRIX is that case airflow is important and it doesn’t have to be a tornado in there, just a steady movement of air. If you can move air directly past the card then it’s even better and we can see how adding a case fan header to the rear edge of the PCB makes sense. We didn’t have any joy in sustaining a material overclock on this one. When you look at the performance and the cost, the ASUS RX460 STRIX delivers a good gaming experience for the asking price. The cooler is Premium-grade and there is nothing ‘cheap’ about the product. 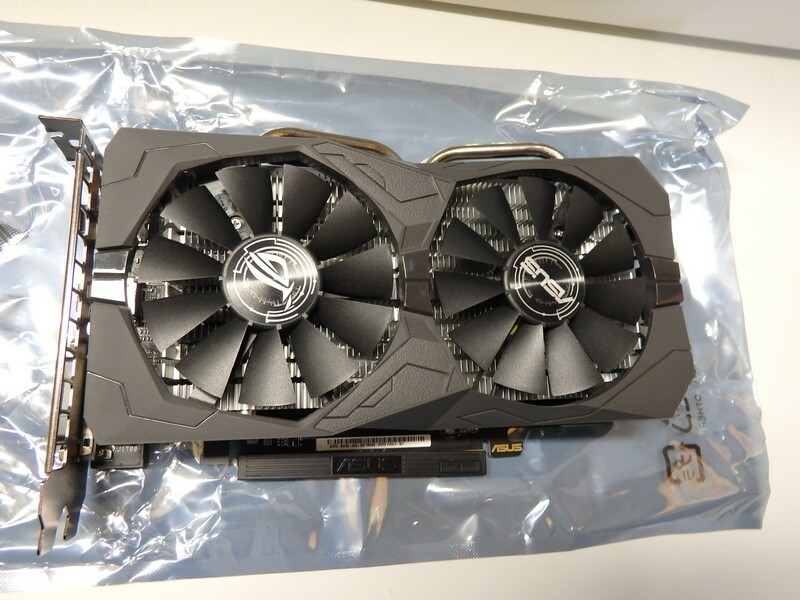 This testing experience has raised the bar considerably on what gamers can expect from entry-level graphics cards. When you look at the testing results, specifically the game-play instead of the synthetic benchmarks, it’s pretty clear that if you game in the 1920×1080 resolution and don’t want to drop more than $250 on a card, the RX460 could very well be the answer to your prayers. 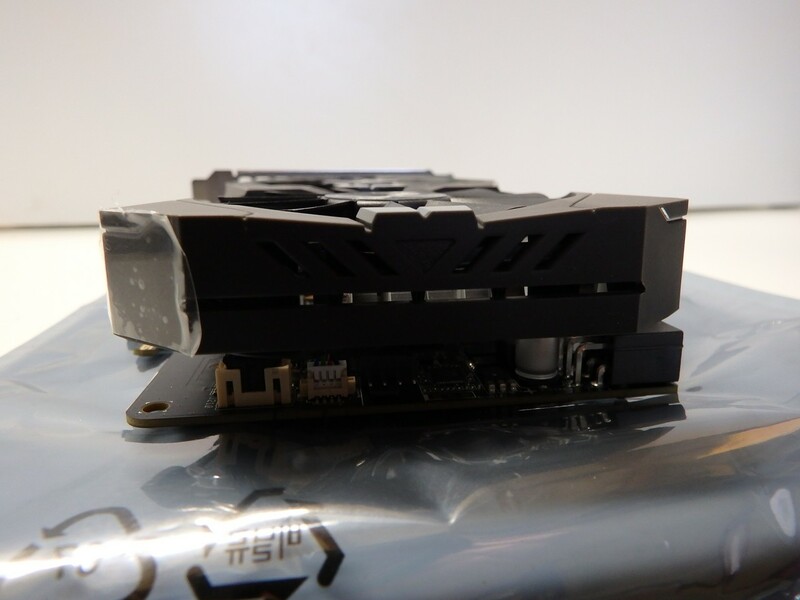 This card is also great for casual gamers, people looking to upgrade from integrated graphics or perhaps students who use their PC to study, watch movies and are looking to have the option of gaming. 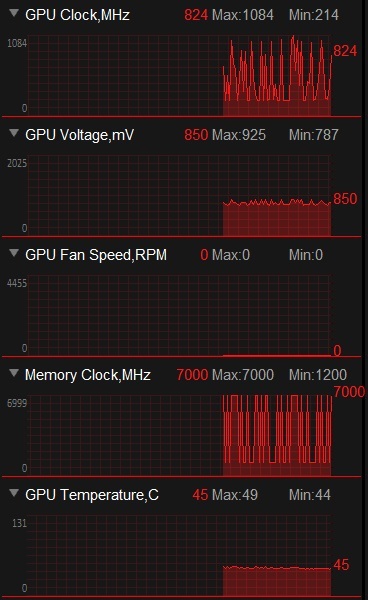 Whilst not packing the same sort of gaming grunt that I’m used to seeing and on the back of some serious testing with the GTX 1080 and RX480, I noticed the change of pace. When using the RX460 STRIX, I made a point of not gaming on anything else for about 3 weeks and adjusted the graphics options in my games to give me as close to 60FPS as I could get with a 1920×1080 resolution on a FreeSync display. For the most part, the experience was very good and I only found some of the more demanding titles losing their shine. During this testing I also adjusted my preference of gaming titles to eSports and budget titles, really getting back into Black Ops II, CS:GO, Starcraft II, Doom and a bit of Battlefield 4. All of these played fine and I couldn’t complain about my stats. The Division was playable at the medium pre-set but there were slow downs from time to time that reminded me of what I had running under the hood. Generally speaking it was ok but the drop in quality from ultra to medium combined with the frame rate drops in heavy action put the RX460 GPU in its place. One of my biggest surprises came when playing Fallout 4 in that it was very stable and solid at High settings without any mods installed. As a game, I really enjoy the Fallout 4 experience and found that I was able to get immersed in the game, exploring and levelling up – completely focused on the game without any performance issues from a lower end graphics card detracting from the experience. The aesthetics and features of the ASUS RX460 present the capable RX460 GPU in the best light possible. ASUS has squeezed that little bit extra performance out from AMDs new RX460 while dressing the card up to make it a true ‘premium’ version. 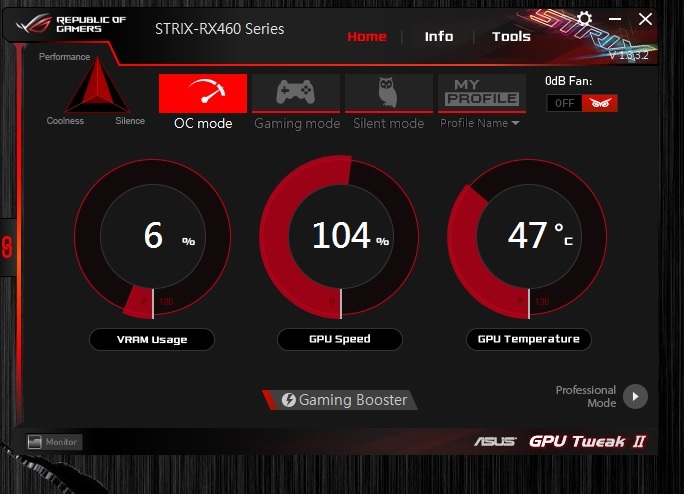 Do your research, think about what you play and if the RX460 has all the grunt you need, the ASUS STRIX edition is a safe bet. We can’t recall seeing a sub $250 card looking so good.